Hosier Lane continues to subtly change, even though the major development has been stopped by the new government, and the smell of aerosol paint still lingers in the air. Hosier Lane was once part of Melbourne’s garment district and Melbourne’s Communist Party Headquarters was at 3 Hosier Lane from 1936 to 1939. Old school graffiti writers and old lefties, like Jeff Sparrow bemoan the changes but I enjoy the vitality of the lane. Now the sound of a busker is now common in the lane, not surprising given the amount of foot traffic in the area. You can get a take-away coffee in the lane from Good to Go, a social enterprise cafe providing barista experience to long term unemployed, definitely a good improvement. 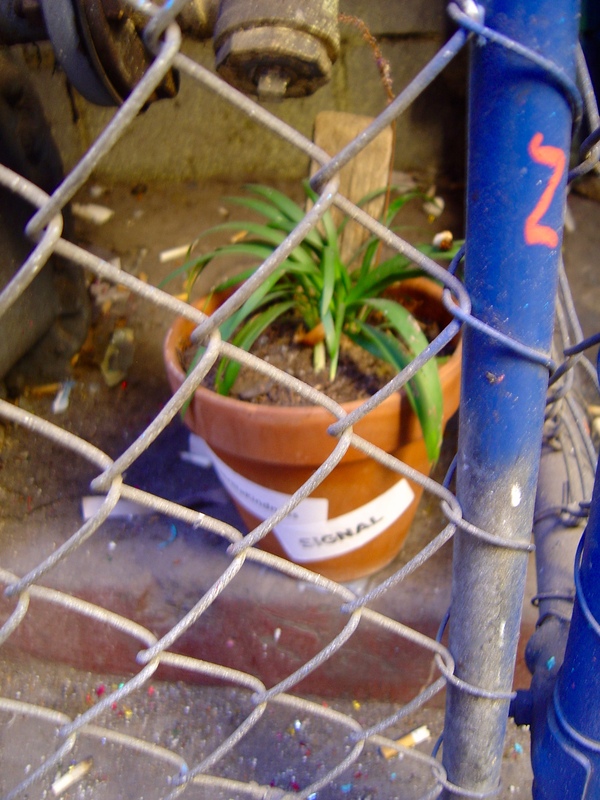 Guerrilla gardening has started in the lane; the sticker suggests that it is a project by Signal. Looking at the art in lane is now like seeing an exhibition opening. It is hard to see the art for all the people, mostly taking photographs. Hosier Lane must now be the most photographed place in Melbourne, there are so many people with all kinds of cameras taking photographs every day. You can hardly move without stepping in front of someone’s shot. Wedding photographs, selfies, tourist snap shots, videos, creating a hyperreal digital version of the lane for Facebook, Instagram and other social media. 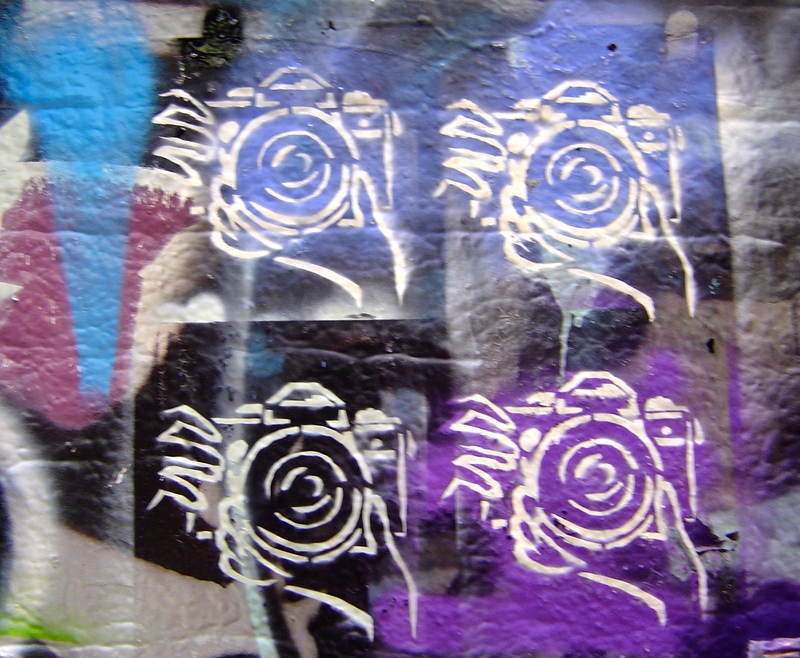 Street art is now influence on commercial photography. 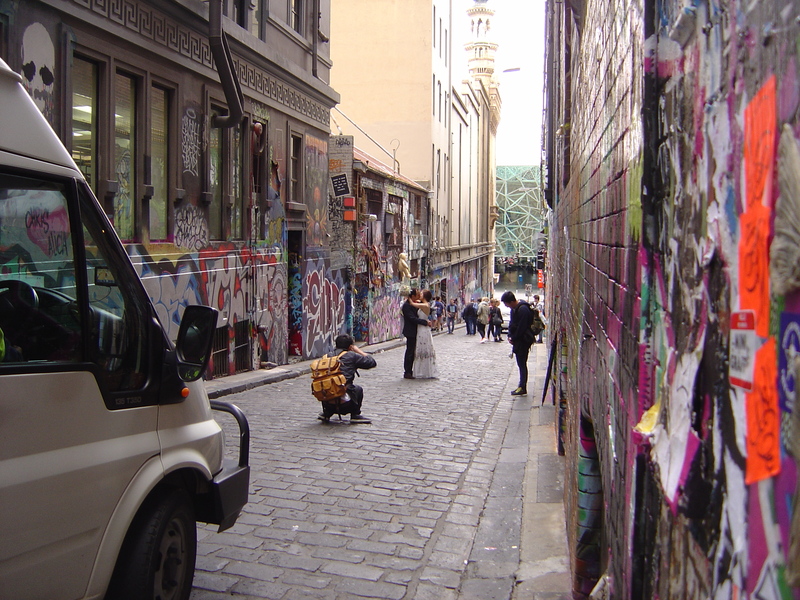 It is not surprising, the lane is spectacular and centrally located and other municipalities in Melbourne are starting to realise the potential for street art as a tourist attraction. 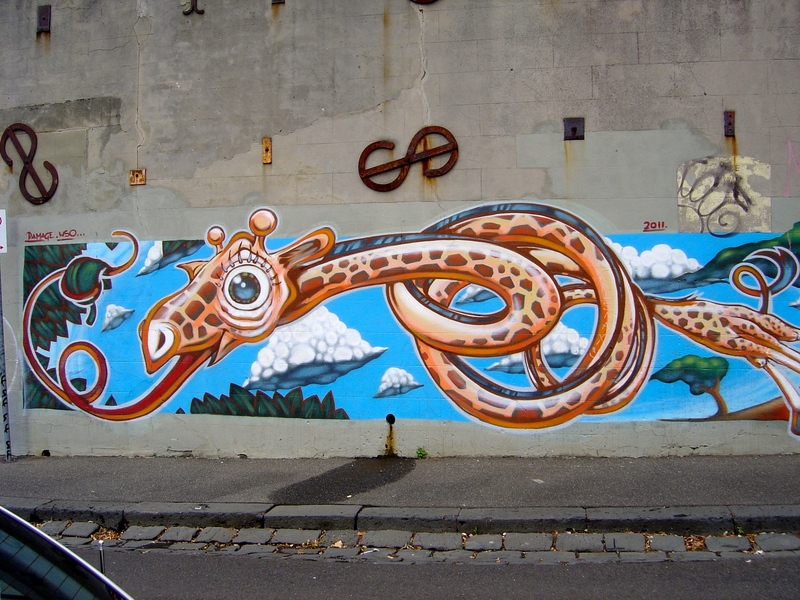 This week the City of Yarra is calling for street art tours of the area. The City of Yarra has had this potential for years, I went on a short tour given by Makatron a couple of years ago and back in 2007 the Melbourne Stencil Festival was running booked out tours of Collingwood and Fitzroy. Melbourne’s street art is now part of Australia’s foreign policy. Most recently with notable street artists Adnate, Civil, HaHa, Vexta, Makatron and others painting murals in Singapore for the Australian government to celebrate 50 years of diplomatic relations with Singapore. All of this is what could be called an organic development; it has not been directed or controlled, it has even and continues to be resisted on some levels. Back in 2008 I would hear street art insiders saying that the scene had peaked years before; what ever they meant by ‘peaked’ maybe just when they and their mates did their best stuff. Melbourne’s street art and graffiti scene continues to change and evolve (I don’t want to write for the better or worse) to take advantage of new walls, spaces, ideas and opportunities. This entry was posted on Thursday, May 21st, 2015 at 2:30 PM	and tagged with City of Yarra, Fitzroy, Hosier Lane, Makatron, Melbourne, photography, Singapore and posted in Culture Notes, Street Art. You can follow any responses to this entry through the RSS 2.0 feed.